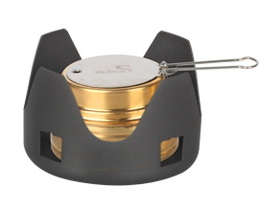 The ultralight Alocs spirit burner and stand is a great addition to a lightweight pot or cup. The stand can support any pot with a width more than 110mm. 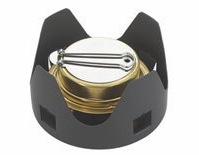 The Alocs Spirit burner comes complete with burner base, simmer lid with new design feature and “O” ring sealed lid. The burner will burn Methelated spirits which is a great cheap method to run such a stove. 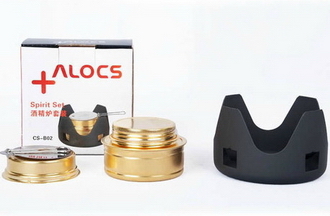 The stand has advanced hard anodized technology. The thickness of the oxidation film is between 25um~35um, the surface hardness of the film is over HV400. 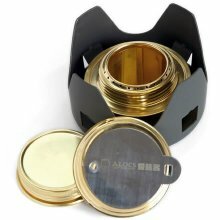 The hard anodized finish is abraision resistant and corrosion resistant. Superior Food Safety Aluminium - the material of the product is superior food safety aluminium, which is lightweight, heat-conducting and hard. Considering weight, heat transfer, serviceability etc, the thickness of the product is in accordance with the princaple of lightweight and durability ethos. CE, LFGB, FDA Food safety approvals for surface treatment. 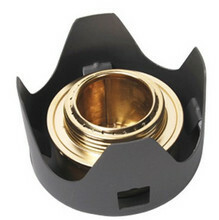 Pot support acts as windshield yet is ventilated to allow for good air flow to ensure continual flame power.